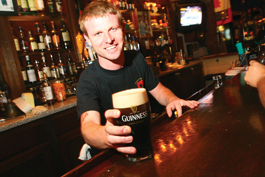 Directly from Ireland, David Mulvehill tends bar at O'Flaherty's in San Jose. PUBS AND PUB culture have found fertile ground in Silicon Valley. Whether old school like Cupertino's Duke of Edinburgh and the Trials in San Jose or neotraditional like Campbell's Katie Bloom's and Martins West in Redwood City, the pub's appeal extends well beyond a place to get a drink. "It's a social space," says John Goldstein, bartender at downtown San Jose's O'Flaherty's Irish Pub. "It's a meeting place. It's just a relaxing place to come. ... Plus we pour proper Guinness, which you don't get at a lot of places." He claims the pub is Silicon Valley's No. 1 seller of the 250-year-old brew my Irish friend affectionately calls "mother's milk" when it first crosses her lips. "It's like being a Norm [from Cheers] when I walk in here," said an Irish-born regular customer who declined to give his name because he was in the midst of a divorce and didn't want his wife to know he was sipping on a pint midday. "It's like the sign says out front: "'You're a stranger here but once.'" O'Flaherty's is done up in brick and dark-stained wood with a long bar and looks every bit the Dublin pub. The place is apparently legit enough to have hosted the Irish national rugby team when they were in town recently. Like most local pubs, there are no DJs or surly bouncers, and while the bartenders would probably make you a cosmopolitan or a chocolate martini if you asked, you'd be much better off ordering a pint of Guinness or a dram of whisky from the pub's prodigious list of spirits. Along with the Britannia Arms, Cupertino's Duke of Edinburgh is one of Silicon Valley's oldest pubs. Opened by three Englishmen and one American in 1983 who wanted to bring pub life to America, the founders essentially had the pub built in England and shipped it to the port of Oakland in a container. Everything within the Duke's four walls—the bar, the ceiling, the carpet, the lamps, the red velvet booths—was made in England and shipped west to Cupertino. The result is a pub that feels refreshingly old and fusty with an insistent but not unpleasant aroma of fish and chips. There's no effort to be hip or cool here. Soccer and rugby matches play on two televisions but their presence is understated. This is a place to talk and drink and perhaps throw a game of darts. It's not a sports bar. "It's a friendly place, not a meat market where young kids are getting drunk and trying to hook up," said bartender Tamara Martin as she pulled a pint of Murphy's Irish Stout. Juan Carlos Deacha is one of the Duke's owners. He came aboard shortly after the pub opened. It was just after 6pm, and a steady stream of regulars walked up the bar. He greeted them by name and their beverage of choice was proffered without having to ask. "That's what a pub is," he said. "It feels like family. They come in and feel like they're at home. It's not a bar. It's a cultural thing." Because of the high-tech companies nearby like Hewlett-Packard, the pub has developed such a following among techies it's often referred to as "building D"—D for Duke. "I'm sure some great deals have been made here," Deacha said. While the Duke of Edinburgh is definitely an old-school place (Deacha calls it a Victorian pub), the genre of drinking establishment has gone decidedly upmarket at Redwood City's new Martins West Gastropub. "We are trying to do farm to table pub fare," said Moira Beveridge, general manager and owner. The original Martins is in Scotland, and chef Michael Dotson traveled there to sample local pub food. His menu gives the pub a NorCal update with a seasonal menu that includes Scottish eggs, black pudding and fish and chips but also offers things like herb-crusted marrow bones with celery and kumquat salad, pheasant and leek sausage and Prather Ranch organic burgers. In spite of its highbrow take on lowbrow pub grub, Martins West is a pub at its core. The bar menu dives deep into scotch whisky and farmhouse ales. In addition to their friendliness and conviviality, I have another theory about the appeal of pubs in Silicon Valley and America at large. While the United States may have the longest-running form of government in the world, we're still a young country with relatively new traditions. Yet walking into your local pub, it's hard not to feel like you're tapping into entering an ancient world, a centuries-old tradition of civilized socializing with your fellow man with glassed of fermented and distilled beverages in hand. Or least that's how I try to explain it to my wife when I say want to head off to the pub for a few pints.